The Constitución III apartment has been renovated, redistributed, decorated and furnished to the detail, seeking the maximum comfort and well-being of our guests. The result is a large property inaugurated in October 2018, with more than 200 m2 in size, distributed in 3 large bedrooms, all with two single beds of 1,05 m x 2,00 m, three bathrooms (two of them ensuite), a large living room with plenty of natural light facing the Constitución avenue, with a dining area and a large double sofa bed of 1,35 mx 2,00 m.
There is also an independent kitchen, equipped with everything you need. The apartment is located on the Constitution Avenue, the best known and most special of Seville, sharing the location with the Cathedral of Seville and Archivo de Indias, both of them located only few meters from the apartment. 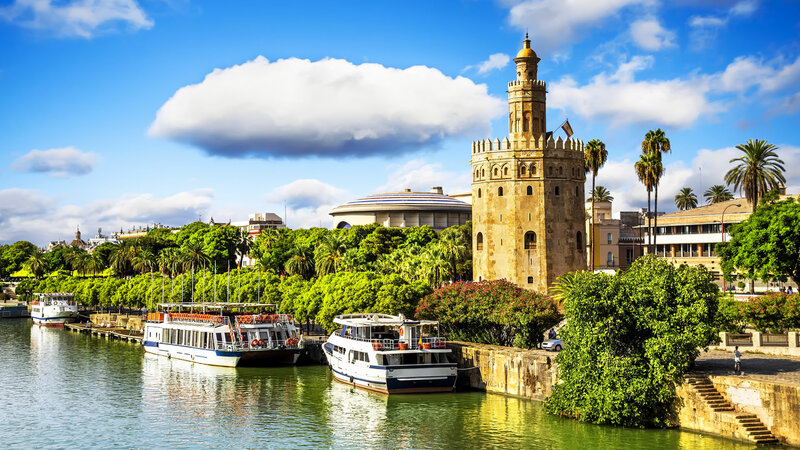 Also you will find other must-see attractions and points of interest in a very short walking distance from the apartment – Alcázar Palace, Giralda tower, Santa Cruz neighborhood etc.. The apartment is in privileged surroundings where you can find small stores, supermarkets, branded clothing stores and of course the best bars and restaurants where you can enjoy the best Andalusian and Sevillian cuisine.